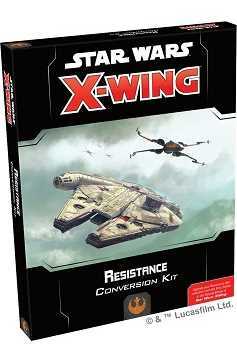 Rekindle hope in the galaxy and take your squad into the future of X-Wing with the Resistance Conversion Kit for X-Wing Second Edition! This kit contains the components you need to begin building your own Second Edition Resistance squadrons with your First Edition ship collection, including pilot cards, upgrade cards, and ship tokens. Among the ship cards and tokens youll find new versions of Resistance heroes like Poe Dameron and Rey, each ready to bring their unique abilities to your custom-built squadrons. These pilots are complemented by more than 100 upgrade cards that give you the power to outfit your squadron however you see fit. .